Mancunian atmospheric black metal Winterfylleth set Cardiff ablaze when they brought their tour to town, celebrating the band’s tenth anniversary. With them were Belgian trio Wiegedood (pronoucned VEE-zhu-dood) as support act, and fellow Brits Necronautical as openers. 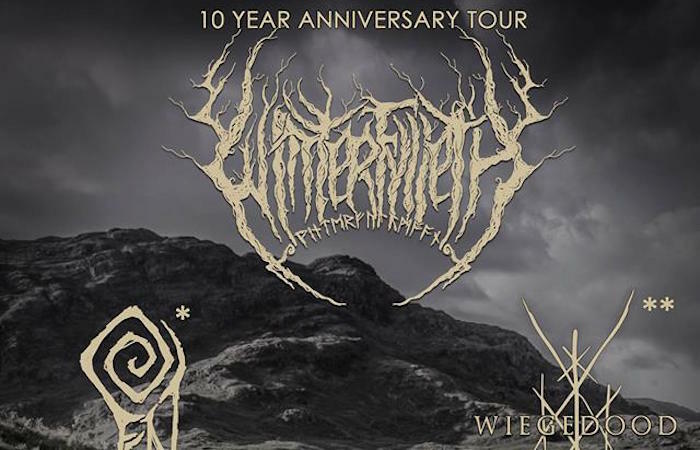 For any group of Winterfylleth’s calibre, a tenth anniversary celebration tour is sure to be the first big milestone in a long career, but also offers a chance to reflect on the progress they’ve made over the last decade. As their name suggests, Necronautical market themselves as dead sailors, and have turned the crushing heaviness and nautical themes of Ahab, for instance, into a furious black metal assault. Their sound may be slightly doom-tinged, but their tremolo guitars and furious blastbeats hark back to the second wave of black metal, albeit more polished than many of those originators. That said, they would not look or sound too out of place in the frozen wastes of the North, with corpse paint and ritual candles on proud display. Punishing their sound might be, but they do not take themselves completely seriously: the lead singer gurned and grimaced at the crowd, occasionally rolling his eyes into the back of his head to enhance his corpse paint with a ‘possessed by a ghost’ vibe. This added a note of humour to their performance, which helped take the edge off the aural assault they demonstrated. They’re currently up-and-coming, but they have the talent to go the distance. I look forward to their own tenth anniversary headline tour. Wiegedood, however, are a very different beast from the two bands they were sandwiched between. The trio create a ferocious wall of noise, with the tremolo guitar attack of Levy Seynaeve (also the vocalist) and Gilles Demolder rounded out by the fearsome drumming of Wim Coppers (both of whom are also in Oathbreaker). Although their set started emotively with ‘Svanesang’, Seynaeve’s shrieking vocals were quickly drowned by said wall of noise, which combined with a lack of dynamics and an unrelenting pace to mean that by the arrival of closer ‘Smeekbede’ there was nothing but a ferocious pummelling maelstrom of black metal. The overshadowing of Synaeve’s vocals may well have been a technical issue, however, as the same thing cropped up later in the evening. It was unfortunate, given the talent on display, but the crowd were able to overlook it and enjoy the set, which is what matters most. Winterfylleth themselves, on the other hand, were on top form. Having caught their rather muddy-sounding set at HRH in Birmingham earlier this year, their performance here in Cardiff was a vast improvement. The mic issues with bassist Nick Wallwork’s mic problem aside, the sound was as rich and layered as only Winterfylleth can make it. Chris Naughton’s harsh vocals were crisp and clear, and the absence of keyboard player Mark Deeks did not hinder the performance. Their set was a true retrospective of their career, taking songs from each of their five studio albums. The crowning moments were an impassioned rendition of ‘Whisper Of The Elements’, the punishing encore of ‘Mam Tor’, and the joyful singing along with a gusto only the Welsh can manage to the opener ‘Gateway To The Dark Peak/The Solitary One Waits For Grace (The Wayfarer pt1)’. Without gimmickry or theatrics, the music was free to envelope the crowd like a thick abyssal fog of sumptuous black metal, one to which they (and I) happily succumbed. 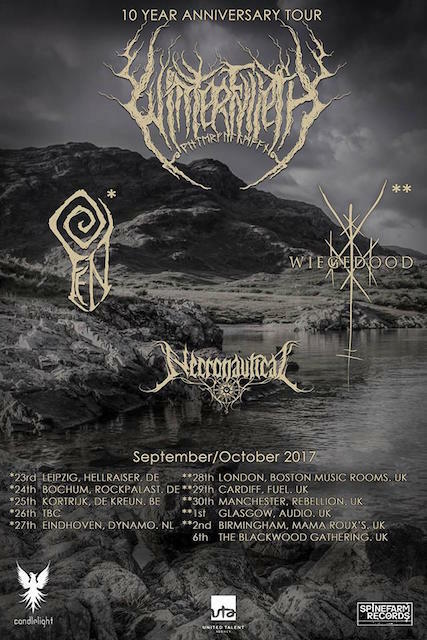 Ten years into their career, Winterfylleth are definitely on their way to black metal superstardom. Personally, it’s quite a shock to realise that while Winterfylleth were crafting their first album from the base of the punishing demo that is Rising Of The Winter Full Moon, I had just finished my GCSEs. Time flies when you’re having fun. Click here to read all our other stuff on Winterfylleth. 1. GCSEs are final exams aged 16 for leaving school in the UK.